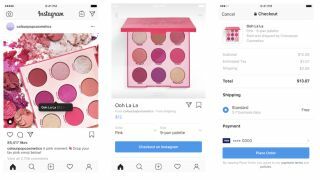 Instagram has announced that it's testing a new feature called Checkout, which will allow users to buy products from fashion, beauty and other brands within the photo-sharing app. In a blog post, Instagram said the feature is currently “in closed beta for businesses, and available to people in the US“, but hasn't mentioned when Checkout will be rolled out to the rest of the world. Judging from the businesses involved in the beta testing period, which include Zara, Adidas, Burberry, Balmain, H&M, Huda Beauty, Prada, and Kylie Cosmetics among others, Instagram is squarely targeting users with an interest in beauty and fashion. Instagram says that “when you tap to view a product from a brand’s shopping post, you’ll see a ’Checkout on Instagram’ button on the product page“. You can then “tap [the button] to select from various options such as size or color, then you’ll proceed to payment without leaving Instagram“. Of course, you'll need to give details like your name, email, billing information, and shipping address at this stage, but Instagram says you'll only need to do this the first time you check out. This is because Instagram will save your information for the next time you shop within the app. Instagram also says you'll receive notifications about shipment and delivery inside the app, which could be convenient if you typically spend more time checking Instagram than you do checking your emails for shipping confirmations when you shop online using more traditional means. It was thought that Instagram would be launching a standalone shopping app called IG Shopping, and it's unclear whether the new Checkout feature will negate any plans the Facebook-owned platform had to expand. What is clear is that tech companies and social media platforms are increasingly investing in super-convenient shopping features, with Google recently testing ’shoppable ads’ within Google Images.